Need a gourmet pick me-up? Our range of gourmet soup flavours make for a deliciously uplifting snack. 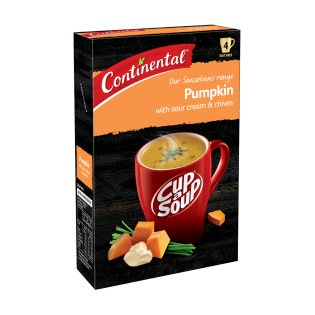 Try Continental Sensations Pumpkin with Sourcream & Chives! When reconstituted: vegetables [pumpkin^ (45%), potato, onion, tomato], thickener (1412), sugar, skim milk, sour cream (3.4%), creamer (contains soybean and milk), salt, mineral salts (339, 450, 451, 452, 508), vegetable oil, chives (1%), maltodextrin, lovage, yeast extract, wheat flour, garlic, natural flavour (contains milk), natural colours (turmeric, paprika), food acids (citric, lactic). ^From responsibly grown pumpkins. Good pick me up on a hiking TRIP. Handy 25gram PACKAGE and soup was good thickness and taste.